I came across these two Christmas puppy poems and immediatly realized they had to be posted on this blog. Every year we see people buying puppies for Christmas to give to their loved ones. How many times have you seen (be it on television, picture in a magazine, etc) a child opening a box and out pops that adorable puppy. Yes it's beautiful at the moment, but come a couple months down the road, they realize that this adorable puppy is more than they expected (especially with our precious Labrador Retrievers), and decide it's to much trouble. Watch your local pet rescues and shelters in Febuary and March and see that they get overrun with dogs in these months. 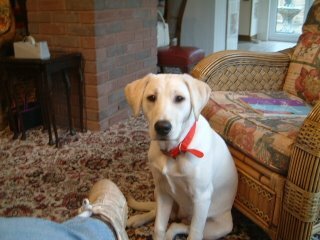 Often people get dogs for all the wrong reasons not thinking about the life long commitment that they are getting into. This is just a simple reminder that are dogs are a lifetime commitment. With no thought of the dog filling their head. Knew he was cold, but didn't care about that. Figuring the dog was free and into the trash. But Santa Claus - his eyes full of tears. Last years Christmas present, now thin and sick. More rapid than eagles he called the dog's name. Let's find this dog a home where he'll be loved by all"
We had gotten the pup for all the wrong reasons. There was one important thing that we missed. A dog should be family, and cared for the same! You don't give a gift, then put it on a chain. "You weren't given a gift! You were given a life!" It seemed like such a good idea in the beginning. There I was, in my cage at the pet store with my brother and sister. I could tell by the crowds in the store everyday that Christmas was drawing near. My brother, sister, and I all hoped each morning that today would be the day we would go to a new home, one filled with loving, caring people. First it was the beagle in the cage next to us. I saw the excited gleam in his eye as his new family prepared to take him home. I hoped one day that Iwould feel the same excitement. Then the cute little bunny from one aisle over was picked. When the ferret with the bad case of psoriasis found a newhome, I began to think I would stay a pet store puppy forever! Finally, it happened. I had seen the couple in the store the week before, talking about bringing home a Christmas puppy for their son Billy. You see, Billy was eight years old, and had been pestering his folks for a puppy for some time now. Although they were busy people, they had decided that a new puppy would make the ideal Christmas present for Billy. The car ride home was exhilarating and terrifying at the same time. It seemed so cold outside, and I was very glad that Billy would keep me inside. I stayed at Billy's aunt's house until the night before Christmas, so as not to ruin the surprise. That night, Billy's dad put me in a small, dark box with a couple of holes punched in the side for air. I could see through the holes the pretty green bow they had tied around my box. Finally, it came time for Billy to open his presents. There was a GI Joe figure, some new slippers, and a big truck or two. At last, I felt my box being picked up and heard Billy's mom say, "OK, Billy, one more present. We saved the best for last". I felt like I was going to turn inside out with anticipation, when suddenly the box was flooded with light and there was my new boy, Billy. He shrieked so loud when he saw me that it was a little bit scary! "A puppy, a puppy!" The first few days with Billy were puppy heaven! He was out of school you see, and had lots of time to take care of me. We played all day, and I slept in his bed at night. Things just couldn't have been better. After a week or so, Billy's mom took me to my new doctor. By then, Billy's holiday vacation was over and he was back in school. The doctor told Mom all about how to keep me healthy and happy. Mom did seem a little distracted though, especially when the nurse from school called on her cell phone to say that Billy had a bloody nose. I didn't even mind the shot I had to get, because like the doctor told me it was better than getting sick! As Mom and I left, the doctor reminded us that I needed more than just one shot to be protected, and I should come back in a month for another check-up. I never saw the doctor again. As time went by, I really started to grow! I suppose that I wasn't quite as cute as before, because Billy and I didn't spend as much time together. He seemed to have a lot of things to do beside take me for walks and fill my food bowl. Billy and his friends sat in front of a strange box filled with moving pictures every afternoon, playing some game I suppose. Heck, I couldn't even pronounce Nintendo, much less play those kind of games. I started to get confused about what my real name was. At first, everyone called me Petey, which I thought was a great name. A funny thing started to happen when I got to be about six months old. Mom and Dad stopped calling me Petey, and started calling me "the dog". I guess that was OK, I am a dog after all. A few weeks later though, they changed my name again. Now I was "that damn dog". I wasn't sure, but I didn't think that was such a nice name. Since my family didn't have much time for me anymore, I had to think of things to do on my own. I liked to chew, and so I did! Remember that GI Joe, Billy got for Christmas? Well somehow I managed to chew off his left leg, which Billy seemed mad about. After a couple more incidents like that, Billy's dad decided I should live outside. Well, spring had come, and the weather was nice so I figured, why not? I thought they would build me one of those nice doghouses like I had seen in the pet store. Maybe it would have carpeting and a soft blanket to sleep on. Well, they must have forgotten to build it, because I spent most of the time tied to a tree in the yard. That was OK for a while, but I began to get pretty bored. I found some nice soft dirt to dig in, but that made Mom mad. Something about flower bulbs and grass seed that I really didn't understand. There was a dog next door tied to a tree in his yard, so we spent most of the day talking. For some reason, that made Dad mad too! I just couldn't seem to do anything right. Finally, one day I heard Dad say to Mom, "I don't care how you do it, just get rid of that damn dog!" I figured Billy would convince them I should stay, but he didn't much care one way or the other. Mom came outside and unhooked me from the chain. She put an old belt of Dad's through my collar and we went out to the car. At first I thought it was time to go to the doctor's for a checkup. Once we drove off though, we headed in the opposite direction. I could hear all the dogs talking inside the building as soon as we turned into the driveway. Mom and I went inside, and she handed the belt to the lady at the counter. Then she patted my head, and walked away, without me. The lady at the desk took me in the back and put me in a cage like the one I had in the pet store, only colder and dirtier. The room was filled with dogs, I even saw that cute Beagle I had known at the pet store. That was five days ago. I guess that I must have a new home now, because a man came by this morning and put a red sticker on my cage door. Here comes the lady who feeds me, and she is carrying a thing to give shots with, just like my doctor did. As she walks me into another room, I see some of the friends I have made in this new place. Funny, they all seem to be asleep on the floor. Oh well, the lady just told me not to worry, everything would be all right. She seems sad though, and I don't really understand why. Maybe being a Christmas puppy wasn't so great after all. 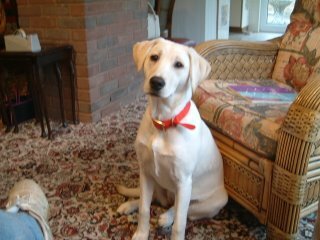 but I told her I'm not much different than most Labrador puppies my age. Thanks Jayne for the great pictures and good luck with her training. Just an update from Nicola on her Labrador Retriever's paw problem. "Buddy" had his pad ripped open and glued back by the vet, but was constantly licking the paw and had problems on walks. See Labrador Paw Problem. "Thanks for emailing me back about Buddy's paw.I have been bathing it in aloe vera and within 2 days he has no longer been licking his paw. I did take budddy to a new place where there was lots of woodland, but he seems much better. You have helped me alot. Thanks very much...Mrs Roberts "
Please provide me with some more information and we will see if we can correct Lilly's chewing condition. 1. How old is Lilly? 2. Where did you get Lilly from (pet store, breeder, etc)? 3. Are there other dogs besides Lilly? 4. Is Lilly left alone for more than a few hours each day? 5. Is she confined to the home all day? Does she get plenty of exercise and mental stimulation? 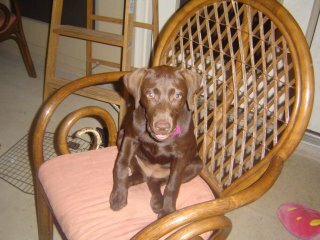 This is part two of an email from Jayne, who is having a problem with her Labrador Retriever puppy chewing everything. Thanks for quick response; let’s see what we can do. First off, many Labs are terrible with chewing things. Lilly is not the first and definitely won't be the last. Chewing is normal for her age, with her permanent teeth getting settled by chewing. Make sure that your home is dog proofed, with nothing lying around that she can get to. One of the best solutions I can recommend is the crate (a question I forgot to ask you). Believe me, your home and all its possessions will be much safer when you are away. I know you said Lilly is not alone much, but for the time she is, the crate will be a tremendous help. Just because your home with Lilly doesn't mean you can watch her every single second. In the blink of an eye, our lovable Labs can get into mischief. If you’re doing something in another part of the house bring Lilly with you. Keep her in with a gate across the room or shutting the door, this way you can keep an eye on her. When you see Lilly start to chew the wrong thing, simply say "Leave It" or "Drop It" in a firm voice while maintaining eye contact until she drops it. Immediately pick up one of Lilly's favorite toys, and give it to her. When she starts to chew it, softly praise her. Jayne, this will take time, consistency and love. Make sure you have plenty of good solid toys for her and that these toys are large enough that the particular dog can't get them into the throat. Last but not least Jayne, make sure Lilly gets her exercise, and plenty of it, as it is essential for her. Plenty of patience and supervision is the key here. Please let me know if this helps and keep me informed of how it is going. If you have any more questions on this or anything else, don't hesitate to ask. 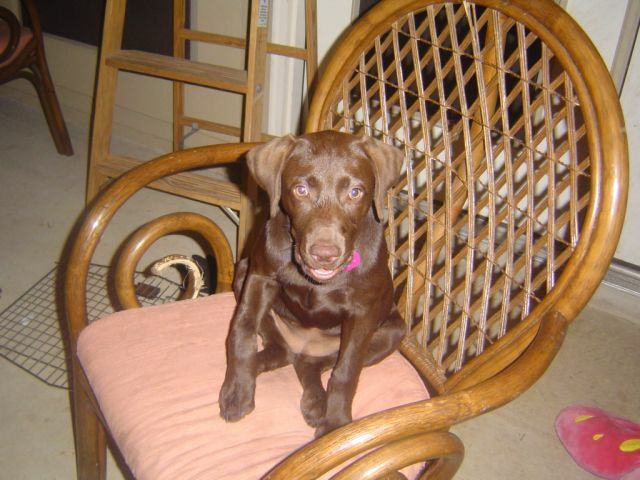 This cute chocolate Labrador Retriever puppy was sent in by Diana. Her name is Princess Daisy Lerma. Diana was having trouble with this little pup play biting (Labrador Retriever puppy biting). Thanks for the photo, she is so adorable.